This review has been a long time coming! I expected to finish this way before Christmas, as I had begun reading it in August. However, life got in the way and I was only reading it for 45 minutes every Friday while I was waiting for Izzie’s dance class. What a wild Friday night, eh? This is the second book in the Kingkiller Chronicles. You can read my review of the first book here. To recap, this is the story of Kvothe. He has many names, kingkiller being one of them. He is recanting his life story to the Chronicler. They are in his inn, along with Kvothe’s right hand man (or is he really??) Bast. Kvothe has lived quite a colorful as an orphaned troupe member, a student of magic at the university, among other things. Not much happens in the first book. I say that the first book is the perfect non-fantasy fantasy book. Anyone who likes to read will enjoy it. It’s more of a story about a story than anything else. The second book is still about the story, but much more happens. Kvothe leaves the university to take a break from the pressure of school and drama surrounding Ambrose, a fellow student who very strongly dislikes Kvothe. He has quite a few adventures when he’s away from school. His main goal is to find out about the Chandrian, a supposedly mythical band of men who killed Kvothe’s parents. He is slowly, ever so slowly, getting closer to find out about them. It has proven difficult, because not many people believe that the Chandrian exist. I enjoyed the second book just as much as the first, but for different reasons. There is more action in the second book and less of the annoying (let’s be honest!) love interest. I still think that anyone can enjoy this fantasy series, even though the second book ever so slightly more fantasy elements. There is not a ton of world building that you have to learn in order to understand the story. Have you read the Kingkiller Chronicles? I would love to hear your thoughts! I can’t wait for the third one to be released, whenever that will be. 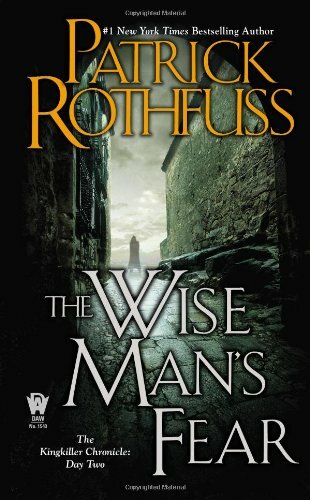 Patrick Rothfuss wrote a companion story that I recently read as well. It’s called The Slow Regard of Silent Things, and it is ‘told’ from the perspective Auri, the fairy-like girl who lives below the university. Spoiler alert: it’s very good. Let me know what you think of the Kingkiller Chronicles when you read them!